Packages starting from $199 Buy Lightning Payroll. Here is a list of answers to our most common support enquiries. If you can’t find the answer you are looking for in the list below, please send your question to support@lightningpayroll.com.au and we’ll get back to you as soon as we can. How Can I Set Up Online Backups? 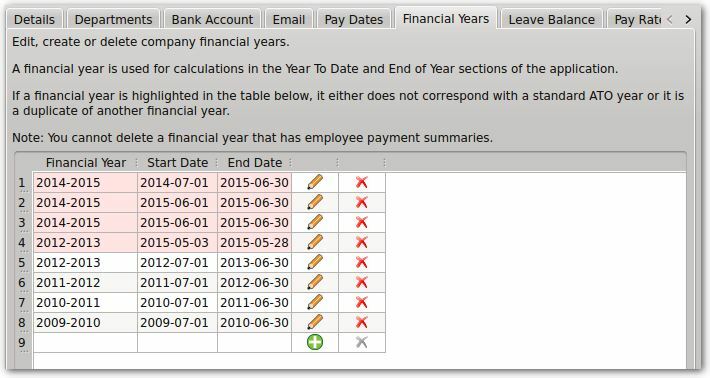 How Can I Backup My Lightning Payroll Data? Lightning Payroll has a built-in Online Backups feature which provides a way for you to easily save your important payroll data to the cloud. These online backups are encrypted and saved securely on our servers. In emergency situations this feature can help you to retrieve your data through your subscription. Note: You will need a reliable internet connection, an active Lightning Payroll subscription and to have registered for this service for the feature to work correctly. See below for more information. This additional online backup service can be misused and needs to be used responsibly. We offer this as a handy extra feature and cannot guarantee the data will always be available, nor accept liability for user error or loss of your data. For this reason it is always a good idea to manage your backups yourself in addition to using this online backup feature. See the above FAQ for more info. To setup automatic online backups go to Tools >> Online Backups. If you haven't yet set up online backups you will be asked to Register and create a password before you can continue. Passwords need to be at least eight characters in length, and for security reasons this password is not the same as your website and/or password application. If you have already registered and need to connect another computer to your existing online backups you will be asked to Login and enter your password. If you have have forgotten your password, the Login screen contains a Forgotten Password area which can email through a password reset code to your nominated email address. Once you're logged in to your Online Backups you can send a backup to our secure server to save the data currently in your program, or you can restore a previously created backup file to continue working on it. The Computer ID field is where you can add a description of the computer you're working on, or a description of the backup file you're creating. The image below shows how backups might be shared between an office computer and a laptop which share the same Lightning Payroll subscription. Only click Restore Backup if you wish to 'wind back the clock' and restore Lightning Payroll's data to an earlier point in time. We recommend you tick the box to Automatically Backup. Also, do not click Logout unless you wish to disable the online backups. Just click Close. Note: There is a FIVE backup limit for each active Lightning Payroll subscription. Once the limit has been reached, any new backups will automatically overwrite the oldest existing backup. Since Lightning Payroll is a desktop application, the data is safely stored in your own computer. We recommend you make yourself familiar with the backup features in the program. To create a backup file, click Tools >> Create backup. This saves an entire copy of your payroll data (for all companies) into one compressed file (.LPB file extension). These files can then be restored via Tools >> Restore backup. 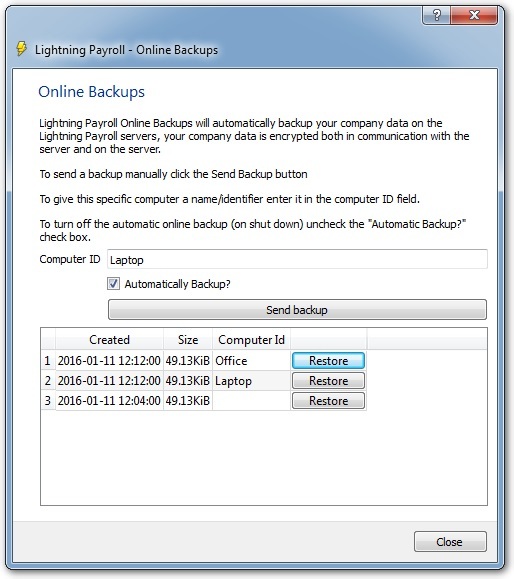 Lightning Payroll can also make regular automatic backups to a designated folder under Settings >> Backups >> Backup your data automatically. How Do I Process EOFY and Lodge With the ATO? How Do I Change Financial Year Dates? Where Can I Find the Latest End of Year Checklist? How Can I Print Payment Summaries (Group Certificates)? Why Doesn't an Allowance Appear on an Employee's Payment Summary? Why Don't my Group Tax Totals Match With End of Year? The ATO allows the following methods of lodgment for your annual PAYG payroll activity. You must lodge the report by 14 August. Paper via the post. Only accepted on the official ATO stationary/forms. Lightning Payroll's printed payment summaries are only suitable for giving to your staff. You will require a valid ABN and an AUSkey to lodge using either of these online methods below. To register for an AUSkey, or for more information regarding AUSkeys click here. These are managed by the Australian Business Register who can be called on 1300 287 539 (1300 AUSkey). Directly from Lightning Payroll (SBR method). Here's a tutorial video demonstrating how to submit from Lightning Payroll's End of Year assistant. AUSkeys can expire, and Lightning Payroll can detect an expired AUSkey. If yours has expired or is invalid it will appear in your credential list like so. Contact the Australian Business Register for AUSkey support on 1300 287 539 (1300 AUSkey). If you would like to view what was submitted, gather an ATO reference number for your submission, or access success/failure messages from your SBR lodgments you can go to Company >> SBR Submissions and click View beside any submission to see an overview of what was lodged with the ATO. Here is an example of a failed submission. In this case the ABN in the chosen AUSkey credential did not match the ABN of the company being submitted. Using the ATO’s Business Portal website, by submitting an EMPDUPE/ECI file. Here's a tutorial video demonstrating how to generate an EMPDUPE file using Lightning Payroll's End of Year assistant. Note: This method is not compatible with Google Chrome or Microsoft Edge browsers. We recommend you use Internet Explorer, Safari or Firefox. Visit the Business Portal website. Click 'Login' (at the bottom of the page). Click 'Run' or 'Yes' to continue past any security/Java notification messages if they appear. They will usually appear along the edges of the window. Select and unlock your AUSkey with your password (call 1300 287 539 if AUSkey fails). Click 'Lodge file' (on the lower left-hand side of the screen). Click 'Choose File' or 'Browse' to locate your ECI/Empdupe file. Select 'Test' if you wish to submit the file for testing. Select 'Lodge' to finalise and submit to the ATO. 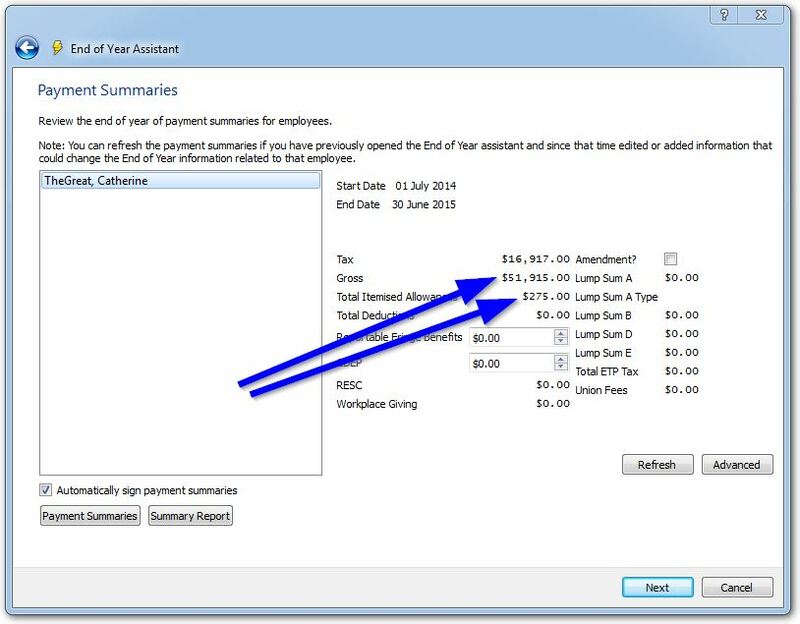 Here's a tutorial video demonstrating how to submit your employee's YTD figures to the ATO using Single Touch Payroll. If you would like to lodge your annual payment summary report on paper, you can do so using the ATO’s paperwork. If you haven’t received a stationary pack from the ATO and wish to submit on paper you can order a PAYG payment summary statement here. Note: The ATO does not accept documents printed from Lightning Payroll. 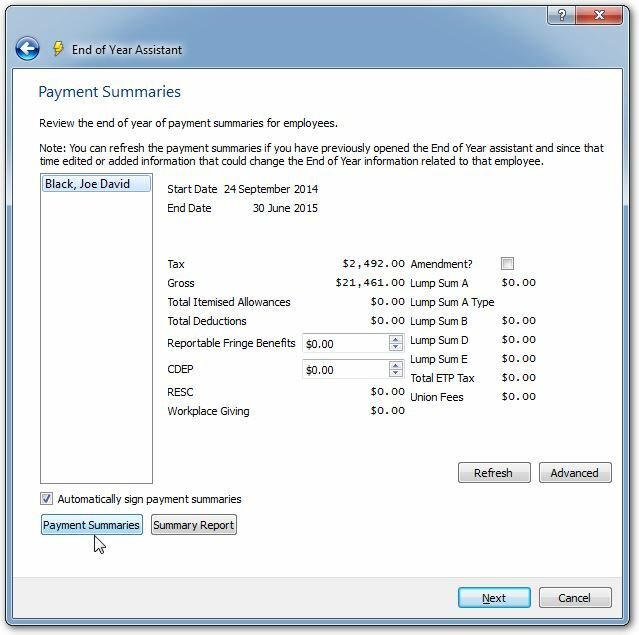 Lightning Payroll can provide printed payment summaries suitable for your staff however, through the Payment Summaries button in the End of Year section of the program. By default, Lightning Payroll takes care of your financial year start and end dates. For example: if a pay period ends on June 30th all of its figures will fall into the old financial year. If a pay period ends on July 1st, all of the figures will appear in the new financial year, because the money will usually be physically paid in the new year. So you shouldn't have to change a thing. If for some reason you need to manually edit financial year boundary dates prior to running through the End of Year process (such as when a company has changed hands, or changed ABN throughout the year) , you can do so under Company >> Financial Years. These dates act like fence posts which section off all pays within a period of time, rounding them up to be processed in the End of Year section of Lightning Payroll. Sometimes an allowance needs to be shown separately to gross payments on an employee's payment summary as shown below. For this to occur the allowance needs to be marked as Itemised under Employees >> Allowances/Deductions >> Allowances. then alter the total allowance by clicking on advanced and clicking on the total itemised allowance button to edit the individual allowances. Then adjust the total gross down by the amount you want. Click here to see the latest Lightning Payroll EOFY checklist mailer. This gets emailed out to all active users each June. To do this, simply click End of Year, select your financial year (FY) and click next. 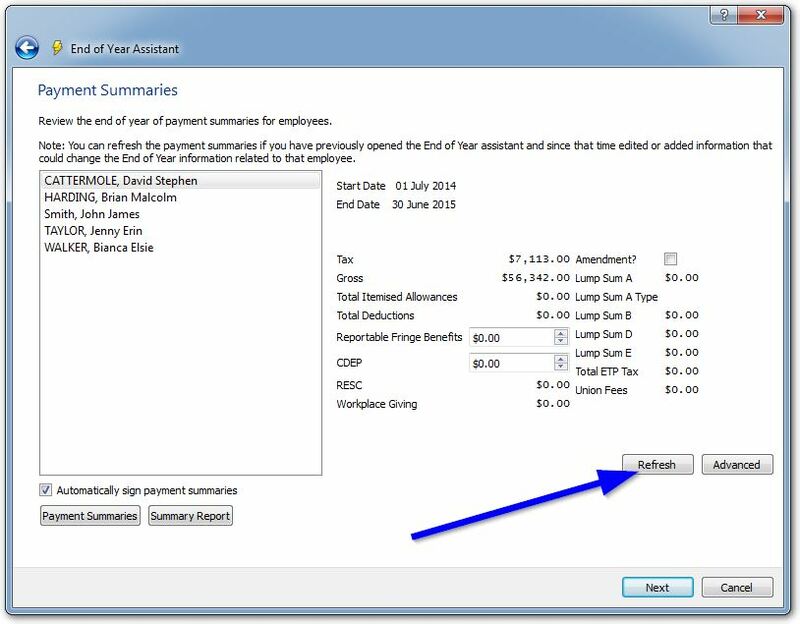 You will then be prompted to select the employees you wish to view/print Payment summaries for, and follow the prompts. Once you are looking at the Payment Summaries screen, click the Payment Summaries button and Lightning Payroll will generate your employees PAYG summaries in a printable PDF format. All you'll need to do is re-apply the 'now-corrected' allowance to just one pay within the financial year you're processing and the yearly total for that allowance will then be reflected on the payment summary. You can do this by using the new Retrospective Tool in Lightning Payroll. 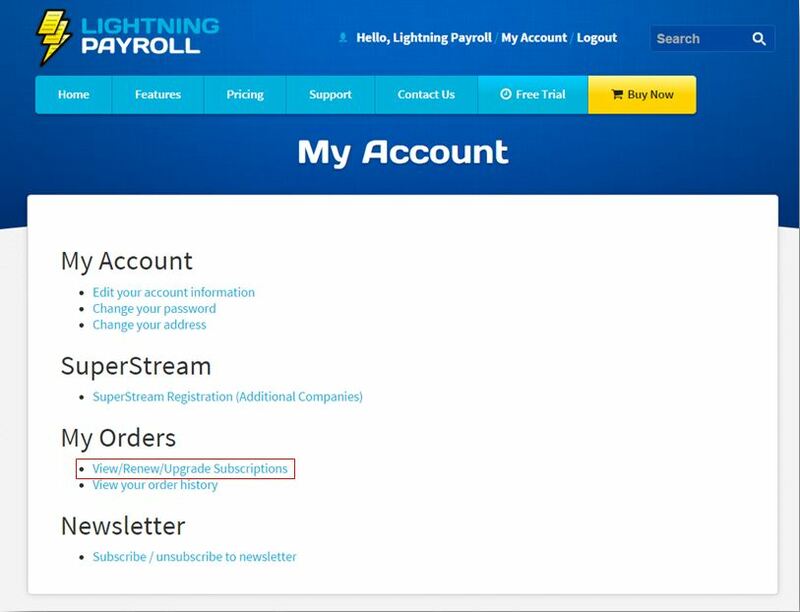 To access this tool, first make sure you are on the most recent version of Lightning Payroll by clicking Check for Updates Now? on the bottom of the Lightning Payroll window. If you are up to date, then go to Tools on the top left hand corner of the screen and select Retrospective Tool from the dropdown. In the new window, set the date range for which you want to adjust pays that include allowances. In this case, we have set it to cover the whole financial year. You can then select the employee or employees whose allowances you wish to adjust. As you can see here, we will be adjusting David's allowances retrospectively so that they are correctly itemised. On the next screen, make sure Allowances is selected from the dropdown. Below, you will be shown all the pays within the previously set date range for the selected employee/s that include allowances. Tick the boxes on the left to select the pays individual you'd like to adjust allowances for. 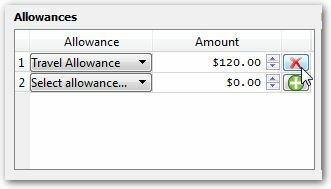 If you want to edit allowances for all pays, click Select All/None. Once you have selected the pays with allowances that you wish to adjust, hit Confirm Pay Selection. On this screen, you will see the available allowances to edit along with their current settings. Select the allowances you wish to adjust and then select Edit. An Add/Edit Allowance window will open for you to make adjustments. Tick Itemised? and then click Save. You will be asked if you wish to make the changes and then to confirm the changes. Once this is completed, you will now see that the selected allowances show True in the Itemised? column. You have now successfully adjusted the selected allowances to be itemised. Click Close on the bottom right to finish. This is usually the case if only one, or a few of the employees are not matching. It means you may have made some corrections to pays throughout the year after already entering into the End of Year area of the program, you may have to refresh the End of Year section so that it draws in the latest changes you've made to the pay data. Highlight the altered employee, and click Refresh to update the figures on their payment summary. If an Employment Termination Payment has occurred during the year (redundancy, wages in lieu, etc.) it will be displayed on a second page of an employee's payment summary. If every employee is not matching when you go to the End of Year section, then there is probably a pay run being left out, or an extra one being included in either the report you're using, or in the financial year being processed. Try running the group tax report again being careful that the dates match the financial year you're processing. If you need to adjust the financial year boundaries You can do so under Company >> Financial Years. If an employee's allowance has been marked as Itemised under Employees >> Allowances/Deductions >> Allowances it will be separated from the gross figure on the employee's payment summary in the End of Year section. The gross which appears under Employees >> Year to Date is inclusive of any itemised allowance similar to the gross YTD amount on their payslip. How Can I Adjust End of Year Totals? Sometimes adjustments need to be made at EOFY time. Perhaps allowances, RESC or deductions need to be altered. It is much easier to correct YTD totals and move on, rather than to return to a past pay. 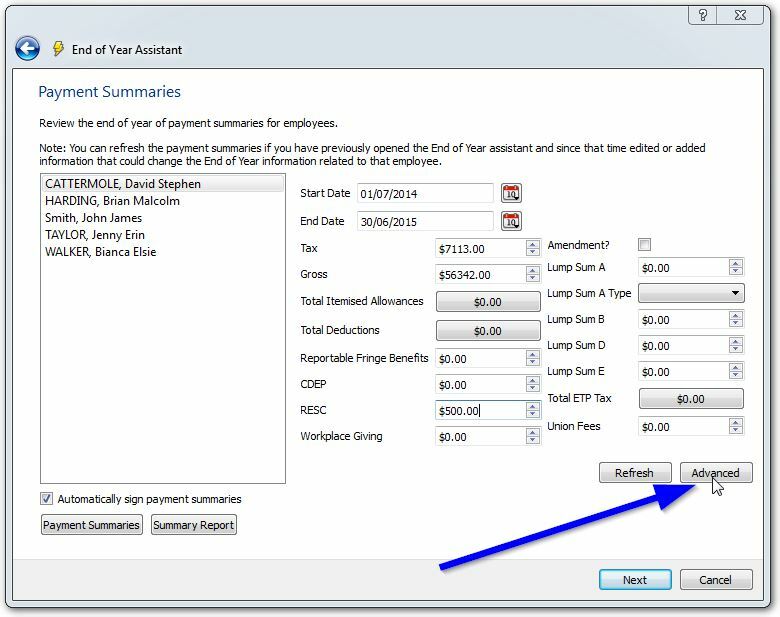 If you need to make adjustments to any figures in end of year totals, click the Advanced button on the Payment Summaries screen. You can then change the values as needed. If you wish to undo any manual adjustments made in this screen, simply click on the Refresh button. How Can I Update to the Latest Version of Lightning Payroll? How Can I Check When My Subscription Expires? How Can I Check What Version of the Software My Computer is Running? How Can I Renew, or Upgrade My Subscription? Where Can I Download the Latest Instruction Manual? Where Can I See a Demo of Lightning Payroll? Lightning Payroll offers automatic updating, which means that any new features or changes to the program come to you at no additional cost. To check that you have automatic updates turned on, you will need to go to Settings >> Updates. Click the Check for Updates Now? at the bottom of the program to check for any newer versions. When your annual subscription is within 60 days from expiration Lightning Payroll will remind you whenever you open the program. We don't automatically invoice our users. 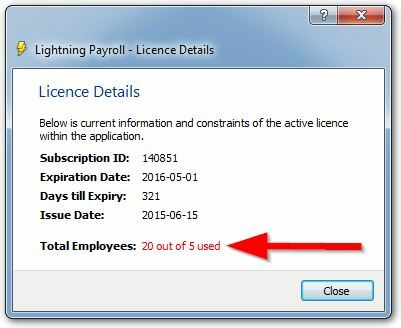 To manually check the expiration date on your Lightning Payroll subscription, open the program and click Tools >> Licence Details. To find out how to renew, or upgrade your subscription to allow more employees click here. You can also view your subscription expiry information by logging into your account under Client Login on the top right of our website. Lightning Payroll >> About Lightning Payroll (on Mac OSX). The version number starts with the financial year. This makes it easy to tell if your version of the program is operating on the latest tax tables, which get updated each financial year by the ATO. If you'd like to ensure your version of Lightning Payroll is the latest available, click here to find out how to update your software. To renew your annual subscription, you will first need to login using your email and account password. If you are unable to login, you should reset your password. Once you have logged in to the My Account section, simply click View/Renew/Upgrade Subscriptions. Click here to download a PDF of the latest user manual. Lightning Payroll is a desktop application for Windows and Mac OSX computers. It is not designed for use on mobile (E.g. IOS, Android, etc) or server-based operating systems. Lightning Payroll is not recommended for screen sizes below 15 inches. While we recommend Lightning Payroll is used on the latest Windows and Mac operating system versions it is compatible with Windows 7 (and above) and Mac OSX 10.11 (El Capitan) and above. Here is a demonstration of how to process a pay in Lightning Payroll. Check out more on our Youtube channel. How Do I Correct or Adjust Leave Totals? How Do I Pay Leave? If one or more of an employee's leave balances have accrued incorrectly, or have been set up incorrectly, they can be manually corrected. Leave balances as at the most recent completed pay can be amended under Employees >> Leave >> Leave Entitlement Adjustments. If you know the correct balance already, simply overwrite the incorrect balance with the correct one. If the total you wish to enter is from another period of time than the most recent completed pay, you can go to Pays >> Last Pay Run >> Edit Pay >> Edit Leave Balances and adjust the balance from whichever period you like. If you don’t know the total and need to recalculate, you can use Lightning Payroll's leave calculators, seen to the right-hand side of the Leave Entitlement Adjustments screen. For more information, please see Chapter 3.7 of our Lightning Payroll user manual. To process leave for an employee, go into the Pays section of the program and then click the Edit Pay button for the employee taking leave. In the Leave tab you can use the green plus button to add a new leave item, or the pencil icon to edit an existing leave entry. Simply select the type of leave you will be paying and alter the other values as necessary. The employee's ordinary time hours will be reduced by the amount of leave taken, to help prevent accidental overpayment. If an employee is going on leave, and you would like to pay them for all of that leave in the one pay period, tax calculations will need to be advised within the program. This can be done at the bottom of the the main Edit Pay window by spreading the tax calculations over multiple pay periods. For example, if you pay weekly and you intend to pay the employee for two weeks leave that they'll be taking, in addition to the week they have just worked, the amount of pay periods you would need to enter would be 3.00 . If an employee wants to be paid out some of their annual leave, or long service leave, without actually taking it, then (unlike in the above method of out paying leave in advance) you would leave the Spread tax over... option set as the default 1.00, and click OK.
How Can I Terminate an Employee? How Can I Make Multiple Payments Using Direct Entry? How Do Time Fields/Boxes Work? How Do I Process Single Touch Payroll? How Do I Process a Pay? To terminate an employee in Lightning Payroll, please go to Pays screen. Edit the employee's pay and press the Terminate Employee button in the lower right-hand corner of the Edit Pay window. Follow the prompts from there to terminate. How Do I Change an Employee's Pay Rates or Salary? To edit the hourly pay rate, or gross payment for a single employee go to Employees >> Pay Settings >> Pay Rates. Simply make the changes you need to make and the new amounts will be ready to use from any Edit Pay screen. To edit or create a pay rate group for multiple employees this can be done under Company >> Pay Rate Groups.This video demonstrates the process of setting up a pay rate group in Lightning Payroll. If an employee's pay rate is changing part-way through a pay period, you just need to partially complete the pay in the Pays area, then make the update to their Pay Settings or Pay Rate Groups as described above. Once the pay settings have been updated, return to the partially completed pay and complete the pay using the updated settings. Why Is An Employee Not Appearing Under Pays? If an employee's name is not appearing in the Pays screen it can be due to a number of causes. Firstly, take a look under Employees >> Pay Settings >> Pay Frequency and make sure the employee matches your usual pay schedule (weekly, fortnightly, etc. ).If the employee is set up on weekly pays, and you process pays fortnightly, this would cause them to not appear. Another thing to check is Employees >> Details >> Employment Dates. If their employment date is set later than the pay period you wish to pay them within, then you will need to wind back their start date. Another thing to check is if they are an active pay recipient, under Employees >> Pay Settings >> Pay Rates >> Active Pay Recipient? . This needs to be ticked to have them appear on the Pays Screen. Still can't see them? Never fear. Maybe you are looking at an old pay run. Pending Pays disappear after two weeks if they have been left Pending. You may need to manually create a pay for that employee. Use the Create Pays button to add in missing, or additional pays. The Direct Entry feature in Lightning Payroll allows you to transfer pays directly from your business account, into your employee’s accounts, or to their superannuation funds. To create a direct entry file for wages/salary, go to Pays >> Direct Entry once a pay run has been saved/completed. This video demonstrates how to make a simple direct entry file for wages/salary. As a result of customer feedback we’ve made some changes to the way Lightning Payroll displays and accepts time and duration amounts. Lightning Payroll’s old time boxes displayed hours and minutes in separate fields (shown below). This example comes from Pays >> Edit Pay and demonstrates how the program used to convert 7.6 hours to 7hr 36m. 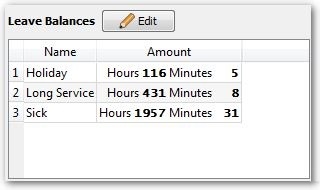 Here is a similar example from the new Edit Pay window demonstrating how 2.5 overtime hours can be converted to 2hr 30m. Simply enter 2.5 and press the Tab key on your keyboard and Lightning converts the .5 hours to 30 minutes. You can also just type ‘2 30’ or ‘2:30’ or ‘2h 30m’ to achieve the same result. You can even include seconds if you ever need further accuracy. These are entered in the same way. For example 7h 35m 30s can also be entered as ‘7 35 30’, ‘7:35:30’ or ‘7.59166’. As soon as you hit the Tab key on your keyboard, Lightning Payroll will convert the amount to a neat 7h 35m 30s. Leave balances are now displayed with increased accuracy, down to the millisecond. The new way (Exactly the same balance shown with far greater precision). Download a printable version of this FAQ here. From July 2018 the ATO will require that employers (with 20 or more employees) align ATO reporting with their pay schedule and submit employee YTD figures using the Single Touch Payroll reporting standard each time pays are made to employees. To process Single Touch Payroll in Lightning Payroll simply complete your pays as usual then click Single Touch >> Submit Payroll to ATO. To check for Single Touch Payroll response messages from the ATO click Single Touch >> Single Touch Mailbox. See Chapter 4 of our Lightning Payroll user manual for more detailed information on processing pays and submitting Single Touch Payroll in Lightning Payroll. This video tutorial demonstrates how to submit Single Touch Payroll information to the ATO. To process a pay or pay run in Lightning Payroll, go to the Pays screen of Lightning Payroll. All pays are marked as Pending until they're either saved, or marked as complete. Click the Edit Pays button to edit from the top of the employee list. To edit an individual pay click Edit Pay beside any employee's name. See Chapter 4 of our Lightning Payroll user manual for more detailed information on processing pays. This video tutorial demonstrates how a standard pay can be completed in the program. How Do I Connect Lightning Payroll to the Internet if I'm Behind an Authenticated Proxy? How Do I Add a New Employee or a New Company? How Can I Enter an Employee's Salary Sacrifice? 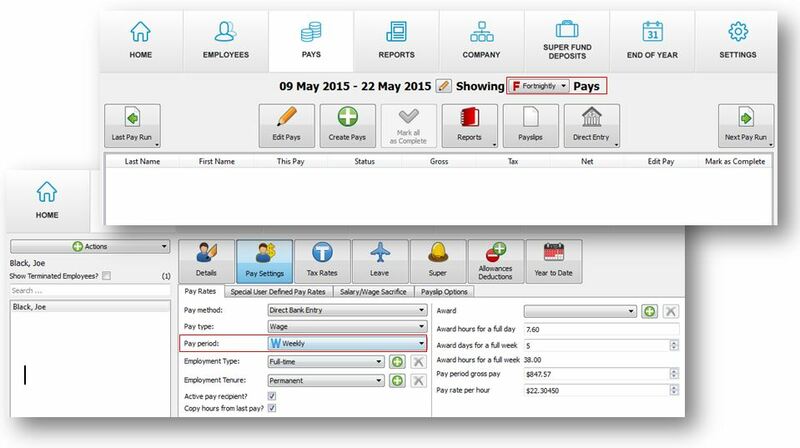 How Do I Email Payslips or Payment Summaries from Lightning Payroll? How Do I Install Lightning Payroll on a New, or Replacement Computer? How Do I Enter Existing Leave Balances? How Do I Enter Existing Year-to-Date Figures? If your company uses a network that involves an authenticated proxy you may have to enter settings under Settings >> Proxy to allow Lightning Payroll to access the internet. This means Lightning Payroll is able to keep you up-to-date with automatic update downloads and allows you to connect to the ATO via SBR and to the national Superstream network. All of these features require Lightning Payroll to have internet access. 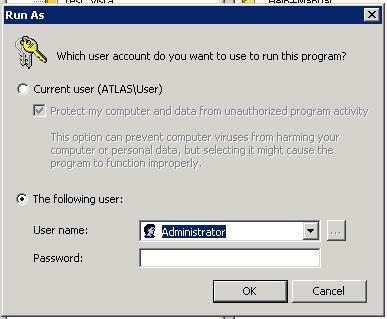 Contact your network administrator, or IT department for appropriate settings if you're unsure of what to enter. Below are some links which you may find helpful when a new employee starts working for you. To add a new employee, go into Lightning Payroll and click Employees >> Actions >> New Employee. Lightning Payroll does not limit the number of companies you can use in the software. To add a new company, simply click Company >> Add new company. Here is a handy tutorial video showing how to setup a new company, and a new employee. To set up a salary sacrifice, head into Employees >> Pay Settings >> Salary/Wage Sacrifice. Enter a description and the amount to be salary sacrificed for each pay. The amount will be deducted from the employee's gross pay, reducing their taxable income. If the salary sacrifice will be going into the employee’s super fund, tick Super/RESC?, otherwise uncheck this option. Tick the Included In Super Calculations? option if you would like to base the employee's super guarantee calculations on the gross plus salary sacrifice. Read what the ATO has to say about salary sacrificing super contributions. Lightning Payroll acts as a basic email client which can log in to your email account. Since each email provider has their own SMTP server settings, you will need to speak with them to get the right setup information. Here's an example of how these settings would look when configured with a Gmail account. Some users who happen to be using these Gmail settings are still encountering errors. A recent change to Google's security settings is the cause of this. Click here and select Turn On to authorize Lightning Payroll to send emails through your Gmail account if you encounter this problem. If you'd like to read more about this change to Google's Gmail security settings you can do so here . 3) Restore a backup through Tools >> Restore backup. 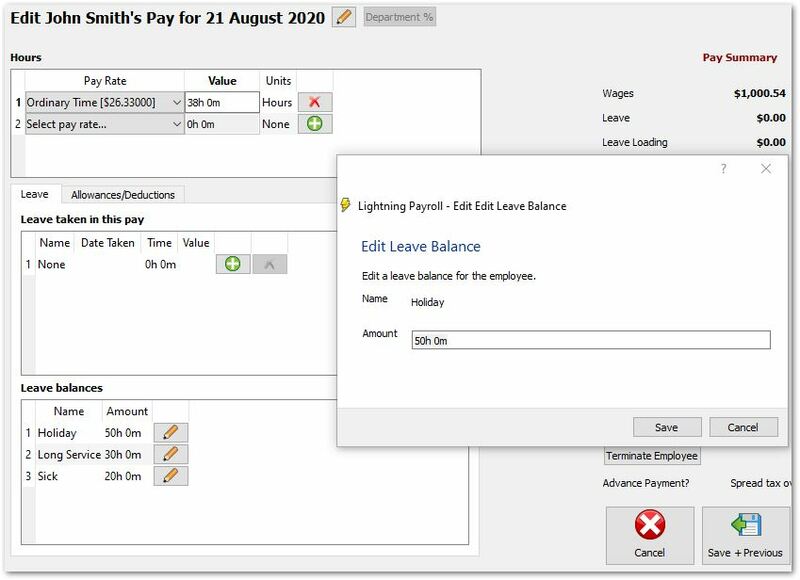 If you are new to Lightning Payroll and setting up an employee with existing leave balances, you can enter your these amounts in their first pay. Once you have gone into the Edit Pay screen for an employee, you will see the Leave Balances Edit button on the left hand side of the screen. Here is where you will be able to enter your initial balances. Previous amounts need to be added to the system generated accruals from the current pay run. Let's say that the employee’s leave balance on their most recent payslip shows 45 hours and 30 minutes of annual leave (45.5 hours). When you click Edit Pay >> Edit Leave Balances you will notice a small amount of leave has accrued. For example, our employee works 38 hours a week, and so they will accrue 2 hours and 55 minutes of annual leave (2.92 hours). You will need to add this amount to their leave balance as of last week. So for this example we would add 2 hours and 55 minutes to our original balance of 45 hours and 30 minutes, which will result in a total 48 hours and 25 minutes (48.42 hours). This is the updated leave balance as at the end of their first pay period inside of Lightning Payroll. To find out more about Editing Leave Balances check out Chapter 4.2 of the Lightning Payroll user manual. Rather than going back to the beginning of the FY and entering all pay information, Lightning Payroll gives you a quick alternative to getting started. If you have the year-to-date (YTD) figures for each employee, you can enter these under Year to Date >> Adjust YTD Totals. Lightning payroll works forward from these amounts as you complete pays. To find out more about the YTD area, check out Chapter 2.5 of the Lightning Payroll user manual. How Can I Resend SuperStream Messages when the Super Fund/s are Holding the Deposited Funds? 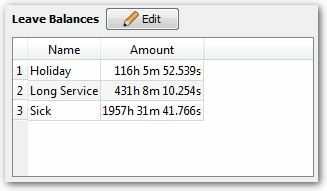 How Can I Resend SuperStream Messages and Super Deposits when the Super Fund/s have Returned the Money to my Account? Where Can I Download the Superstream Checklist? How Do I Add a Super Fund to Lightning Payroll? How Do I Setup Super Funds With Multiple Payment Details? How Can I tell If My Superstream Message Was Sent Correctly? How Do I Check For Superstream Response Messages? How Can I Delete Unused Super Funds? How Do I Pay Super in Lightning Payroll? Sometimes you may need to resend the accompanying SuperStream messages for Super Fund deposits that you have already made. This may be due to the messages failing or otherwise not being received by the Super Fund. 1. Go to the Super Fund Deposits screen and make a note of the 'Deposit Date' of the Super Fund deposits for which you need to resend the messages. 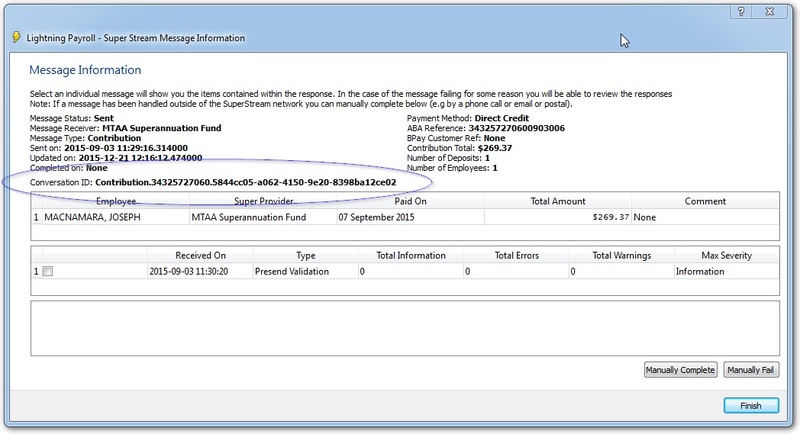 In the box below, you will see the sent messages for your recently created Super Fund deposits. 2. Click View next to the first message that will need to be resent. 3. Then, click Manually Fail on the bottom right of the message information screen and confirm that you wish to fail the message. Finally, hit Finish. 4. Repeat Steps 2 and 3 for the remaining messages. 5. Once all the original messages have been set to status 'Failed' or 'Manually Failed', click Contributions Report on the bottom right of the Mailbox screen. Make sure the start and end dates are set to the sent date of the original messages. Then, 'select all' and click OK.
A SuperStream contributions report will be generated with each Super fund and their reference ID on each line. Save or print this report. 6. Back in the main Super Fund Deposits page, click on the SuperStream Contribution button. Under 'Show Deposits by Date', set the date range to once again be the same as the 'deposit date' of the original deposits. 7. Select all the deposits shown below and then click Next on the bottom right. 8. On this screen, you will be shown the amounts to go to each Super Fund. Click the pencil icon to edit the ABA reference for each fund. Delete the current reference and replace it with the reference ID for that Super Fund from the SuperStream Contributions report you created earlier. Complete this step for every Fund listed on the screen. Once completed, click Next again and on the SuperStream Summary page, click Send Messages. Once the messages have been finished sending, click Finish. You have now successfully resent the SuperStream messages. Sometimes, one or more Super Funds may not be able to match funds you sent to the relevant member. In this situation, once you have received the money back, you will need to send a new message for the deposit and transfer the money again. 1. Go to the Super Fund Deposits screen and make a note of the 'Deposit Date' of the Super Fund deposits for which you need to send the money again along with a new message. 4. Repeat Steps 2 and 3 for any other messages that will need to be sent again to the Super Fund along with the money. 5. Once all the relevant messages have been set to status 'Failed' or 'Manually Failed', click Finish. 7. Select all the deposits that you will be resending the money for. Click Next on the bottom right. You will then be shown a screen confirming the amounts to be sent to each Super Fund. Once the messages have finished sending, click Direct Entry to create and save a file to upload to your online banking portal later so that you can resend the funds to the relevant Super Funds. Finally, click Finish. You have now successfully resent the SuperStream messages and created a new Direct Entry file ready to upload to your online banking portal to transfer the money. Click here to read our lastest Superstream checklist which explains everything you need to know about preparing your data and making Superstream compliant payments in Lightning Payroll. Existing superannuation funds can be connected to your employees under Employees >> Super >> Superannuation Fund and click on the green plus. Clicking the pencil will allow you to edit an existing employee/fund association. You can add more than one fund per employee if you need to. Make sure you tick Is Primary Fund? beside their primary super fund (The fund which will receive all super amounts by default). The Registration Date field can be set to today's date. It simply provides a means of tracking when an employee switches to a different super fund, if they ever do. If a super fund you wish to add is not available in the pre-filled list you'll need to create a new super fund under Settings >> Super Fund Providers. The Online Search method is the easiest way to add most super funds since all you need to begin is the employee fund's ABN or USI(unique superannuation identifier). 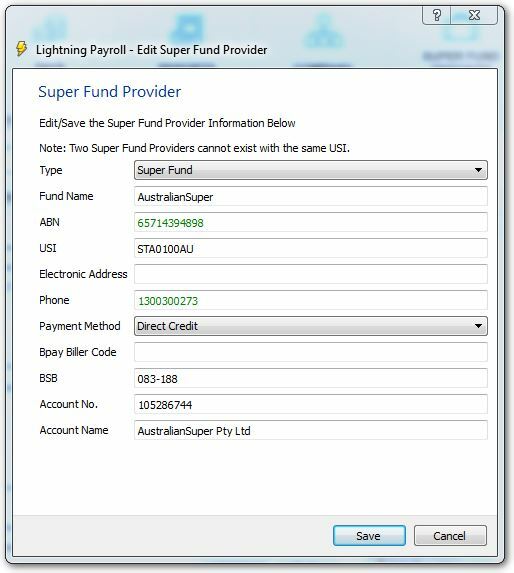 Lightning Payroll then uses this information to connect to the ATO's Fund Validation Service and download the related information for any fund/s you've searched for. You'll then see the search results downloaded from the registered ATO super fund registry. Simply tick the box beside the super fund/s you would like to add to the program and then click Finish. For self managed super funds or non SuperStream compliant funds you will need to set them up manually under Settings >> Super Fund Providers >> Create Super Fund (SMSF/Manual Entry). For major funds the most important information to include is the Fund Name, the ABN and the USI . Lightning Payroll can complete the rest of the fund information (bank details, telephone, etc.) using the Populate Fund Data tool, demonstrated below. 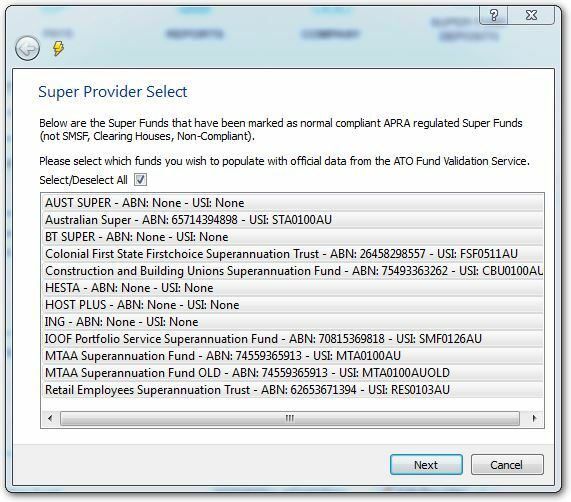 You can obtain super fund ABN/USI information from your employees, from the super funds directly, or from the ATO's Super Fund Lookup page . Self-managed super funds have an electronic address (ESA) instead of a USI. This example sets up an Australian Super product. 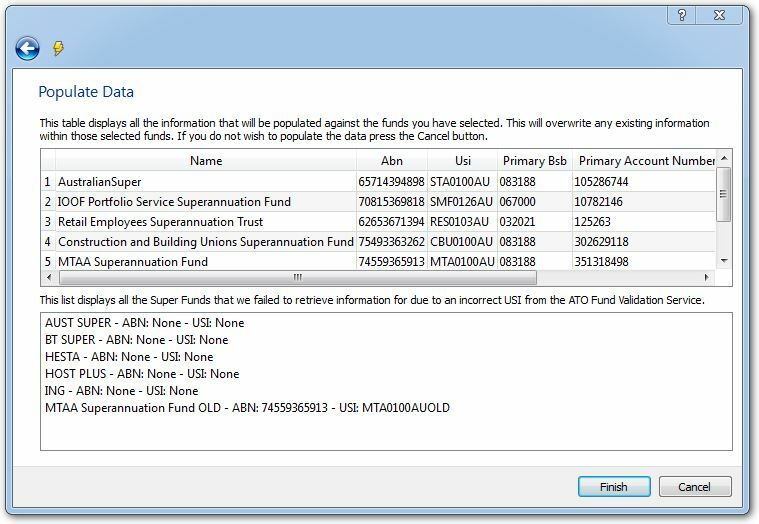 Once the primary information has been entered, you can also Populate Fund Data to refesh the fund info against the product USI (non-SMSF funds only). Select the fund or funds you wish to download details for and click Next. If the ABN and USI are correct, the ATO's fund validation service should locate details and they'll be displayed in the upper box. If no extra details were found, the previously selected fund appears in the lower box. Click Finish and the chosen fund profiles - formerly only partly complete - now include extra information. 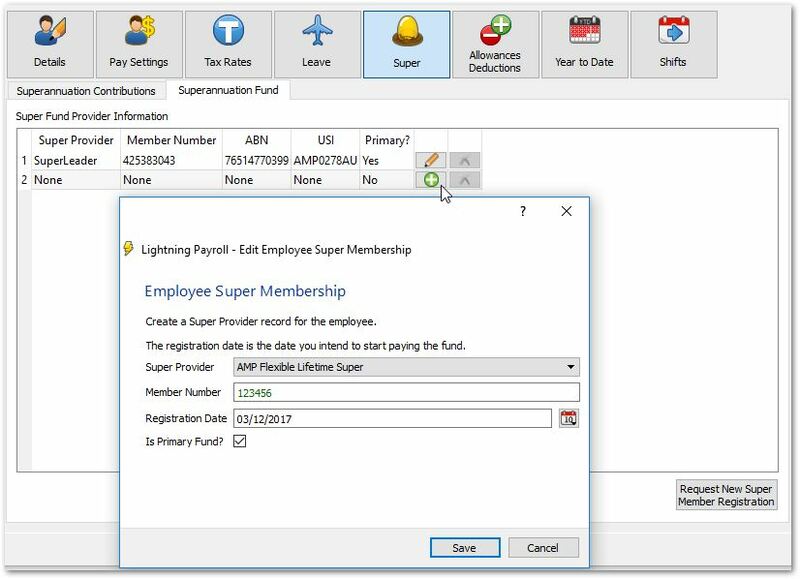 Once you've created the fund just remember to attach it to relevant employees under Employees >> Super >> Superannuation Fund >> Add Super Provider by marking the fund as Primary. If you need to pay a super fund that is yet to provide you with a single bank account as the Superstream standard encourages, you may need to configure the super fund a little differently than how we recommend in our Superstream documentation and videos. For example, if you have a super fund who requires one or more bank deposits per employee within a super deposit cycle, rather than one payment accounting for all employees you have with them, then the fund is not Superstream compliant. Some funds were granted extra leniency with the compliance deadline by the ATO. With non-compliant funds you'll need to create multiple copies of them under Settings >> Super Fund Providers and mark them as a Non-Compliant Super Fund as demonstrated in the image below. We also recommend changing the name of the fund so that it is easy to discern which fund is which when linking it to an employee. Note: You will still need to associate the employee to the appropriate fund (Setting the right fund to Primary) under Employees >> Super >> Superannuation Fund for the program to prepare super payments for the correct listing of the fund. How Do I Pay Super Using BPAY? Note: Lightning Payroll allows you to enter BPAY as a Superstream payment method, but due to a high amount of errors made by users opting to use BPAY for superstream payments, we recommend using Direct Credit as the payment method. 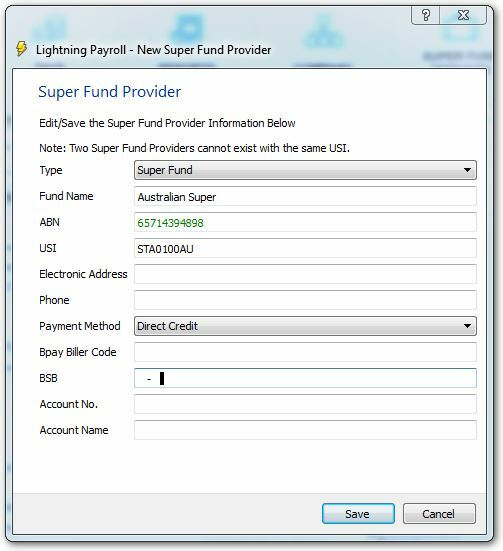 If you are having difficulty getting bank details from a super fund, go to Settings >> Super Fund Providers >> Populate Fund Data to download bank account details for each fund (ABN and USI numbers need to already be filled out for this to work). To setup BPAY as the payment method for a particular super fund, you'll first need to choose BPAY as the payment method when you setup the fund under Settings >> Super Fund Providers. The Biller Code is entered with the super fund information under the Settings area, but the Customer Reference Number/s are to be entered separately under Company >> Super / BPAY Reference. 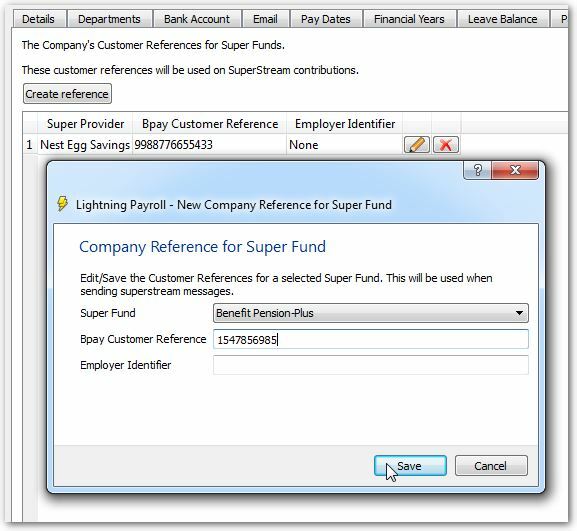 If a super fund provides, or requires you to include an Employer Identifier in your Superstream messages you can add these here too, but this field is not required by most super funds. If you need to add more than one BPAY reference for a single fund, then the fund is not Superstream compliant yet, and you'll need to make a second listing of the fund as described in How Do I Setup Super Funds With Multiple Payment Details?. After you have sent your Superstream message/s, go into the Superstream Mailbox. 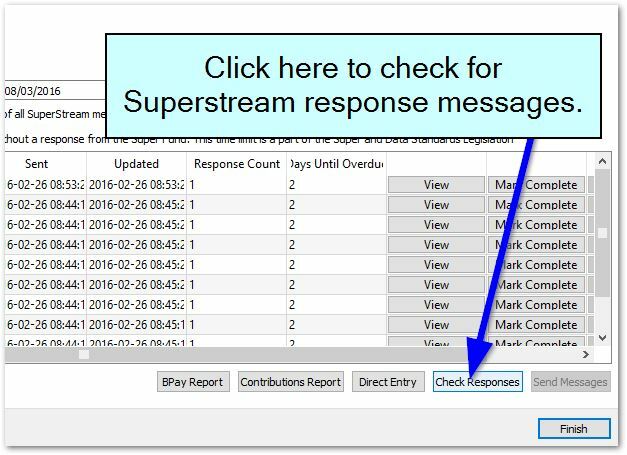 Click Check Responses to refresh the mailbox with the latest message info from the Superstream network. You might not have any responses yet, but don't worry. This is common. Using the date and message status filter boxes at the top of the mailbox (shown below), search for the messages you've just sent. Click View beside the message you'd like to check. If your Superstream message was successfully processed by the network, and forwarded to the super fund there will be a value beside Conversation ID. This acts similarly to a tracking number on a parcel and is the unique identifier for that particular message. It can be provided to a super fund if needed. 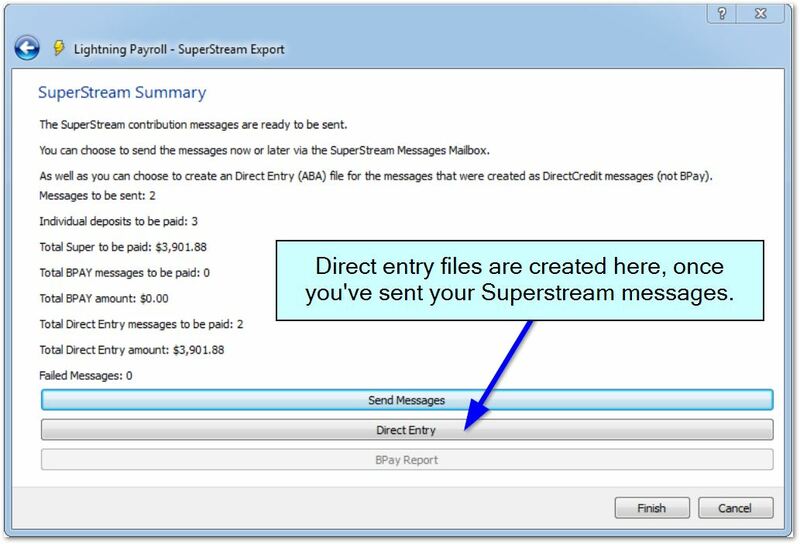 To check for SuperStream message responses go into the Superstream Mailbox located within the Super Fund Deposits area. Click Check Responses and your program will start to download any message updates, or error details. If an error response is detected, you'll notice that the original Superstream message will no longer have a status of Sent. It will most likely have changed to Failed, or Progressive. You can find out more information about the error by clicking View beside the message. To get more info, we recommend contacting the super fund directly. It is actually quite rare to receive responses, since super funds are only required to respond when an error has occurred. If everything went through fine your messages are likely to stay in a Sent status. If you are confident that a super payment was successfully received and processed by the fund, you can mark the message as complete yourself. For more detailed information on the Superstream Mailbox, please see chapter 6.9 of our user manual. You might not be able to delete an unused super fund if it is still connected to an employee or an old deposit, but here's how you can at least make it Inactive and get it out of the way. Go to Settings >> Super Fund Providers. Click Edit Provider beside a fund you wish to get rid of. Set the type to Non-compliant Super Fund. Enter a fake ABN of 10000000000, which is the number one followed by ten zeroes. Untick the Active? box at the bottom. Save the changes. The unused fund is now hidden. 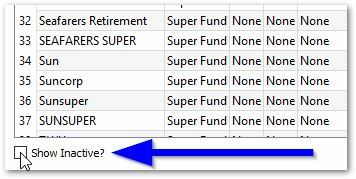 To view your hidden/inactive super funds, tick the Show Inactive? box at the bottom of Settings >> Super Fund Providers. 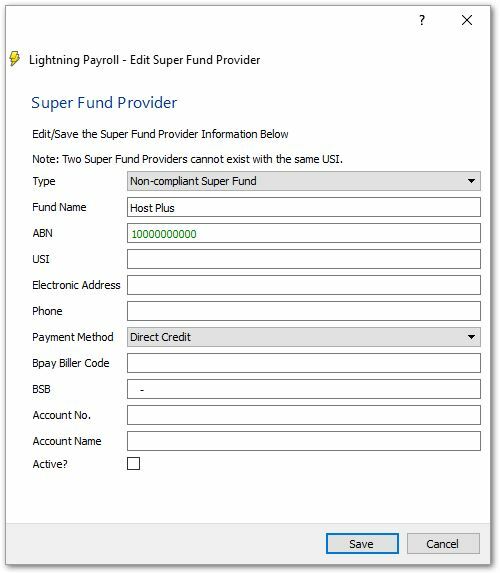 This brief video tutorial demonstrates how to make Superstream compliant super contributions using Lightning Payroll. For more detailed information, we recommend you read our Superstream checklist, or read Chapter 6 of our Lightning Payroll user manual. How Do I Pay Super Using a Direct Entry Banking File? The quickest and most accurate way to make super payments is by using a Direct Entry (.ABA) file. These files are created and saved to your computer at the last stage of the Superstream process (see image below), through the Direct Entry button. They can then be uploaded to your bank, allowing you to pay multiple super funds at once. This saves time and reduces the risk of typing errors. Your bank should be able to guide you through the process of importing a direct entry file, but to help get you started we've rounded up some direct entry instructions for the most common banks. These instructions may change and are current as at March 2016. Please contact your financial institution for the most up-to-date instructions. When creating a payment file you may be prompted for a User ID, which belongs under Company >> Bank Account >> User ID. This is always a six digit number. For most major banks (ANZ, Westpac, NAB) it is six zeroes (000000). For CBA it is 301500. For any other financial institution you will need to contact them and ask for the 'Direct entry User ID', or 'APCA ID'. How Do I Set Up Tax for Employees on a Working Holiday? Why is Lightning Payroll Calculating So Much Tax for One Employee? How Do I Update To The Latest Tax Tables? From 1 January 2017 employers will need to register with the ATO to be able to tax staff using the working holiday tax table rates. Once your company has registered you will be able to apply the working holiday tax scale to applicable employees within Lightning Payroll under Employees >> Tax Rates >> Special Tax Rates >> Working Holiday Tax Scale >> Use Working Holiday Tax Scale. We've also added a report to help keep track of working holiday pays under Reports >> Tax >> Working holiday tax scale summary. This helps show which tax scale has been applied to each of your employees' pays. The most common reason why an employee is being overtaxed is an incorrect Tax File Number. Lightning Payroll uses an Australian Tax File Number validation system which is checked in real-time by simply entering a TFN into an employee’s Tax Rates screen. If the TFN displays in green, it is valid. If the number shows up in red, it is invalid (seen below). If you find the TFN you’ve been given is invalid please use eight zeroes (00000000) as a temporary ‘valid’ TFN while you wait for the employee to verify their correct TFN. Lightning Payroll has the ability to calculate tax on pays from the 2013 financial year through to the current financial year. Each June we release an update which includes any tax changes for the approaching financial year. How Can I Setup the Online Employee Portal? How Do I Set Up Rostered Shifts in Lightning Payroll? How Do I Use the Lightning Payroll Timeclock App? Once activated, employees can access their personal portal by visiting the Lightning Payroll website and clicking Employee Login on the top right. Before activating a portal account for an employee, make sure the employee's email address has been added under Employees > Details > Personal. The portal can be activated for a selected employee in Employees >> Details >> Online Portal. Clicking Activate will allow you to begin selecting what features of the portal the employee can use. Bank Account Details - Selecting this will allow the employee to add, edit or delete bank account details for receiving their pay. The employee can also specify if they wish to have their pay split between multiple accounts automatically. This is where you can select whether the employee can clock in and out of available shifts or add and edit time sheet entries via the online portal. To activate this, you will first need to ensure you have created shifts and assigned them to the relevant employee. Allow Employee to Clock In and Out Through the Timeclock? - Selecting this option will allow the employee to clock in and out of selected available shifts directly via the portal. Clock in and out data entered by the employee can then be synced directly to the employee's pay in Lightning Payroll. Allow Employee to Manually Edit Their Timesheet? - Selecting this option will allow the employee to manually edit their start and end times for selected available shifts. 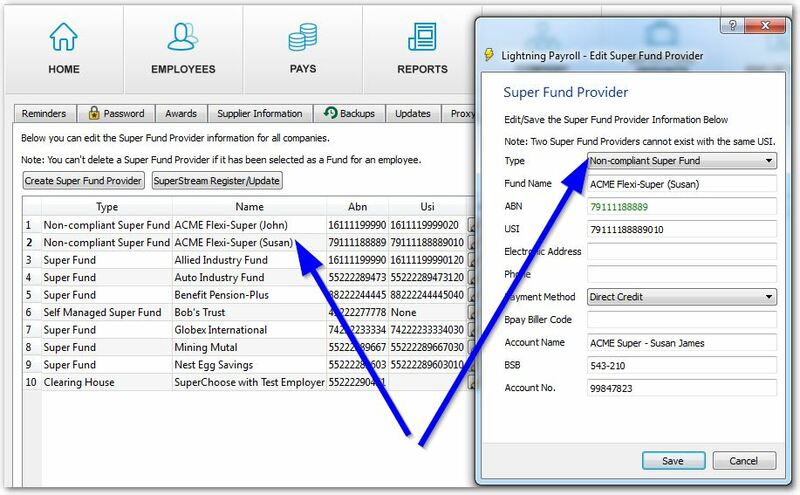 Timesheet data entered by the employee can then be synced directly to the employee's pay in Lightning Payroll. For more information about shifts, please refer to the section Setting Up Shifts in the Rosters chapter of the Lightning Payroll manual. When you are satisfied with the settings, click Refresh Employee Portal to complete the portal activation process. The employee will receive an email with details on how to log in. The employee portal can be setup and activated for each employee individually, however, if you wish to have multiple employees use the portal with the same settings applied, you can use Configure Multiple Employee Portal Settings under the Tools menu. 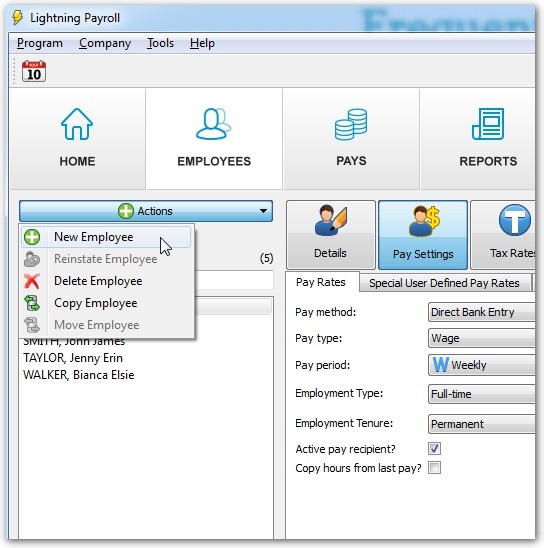 Lightning Payroll allows you to create shift types and schedule a roster for certain shifts and employees. These rostered shifts can then be used to fill-in your pays, saving time on data entry. Please click here for related timeclock information. To begin setting up shifts in Lightning Payroll, go to Company >> Shifts. To add a new shift type, use the green plus on the right. After that, just make sure to add any employees who may be required to work this shift at the bottom of this screen. When editing a company-wide shift in the New Company Shift screen, the times, durations and pay rate are just defaults, or placeholders for this shift type. If a shift type is likely to change, that's fine, because any shift can be tailored for a particular employee or a particular date elsewhere, as described below. If an employee tends to receive a particular pay rate, allowance or happens to work a shift on a regular basis you can configure this information under Employees >> Shifts. All company shifts linked to an employee will be visible in this screen. To customise a shift for an employee use the pencil button to the right of the shift. In this example we can see that when David works his Late Shift he is paid at his Time and a half pay rate (for every hour worked) and receives a Late Shift Allowance of $10 per shift. At the bottom of the screen it shows that this shift is set to repeat (be automatically rostered) weekly every Monday and Tuesday. Note: If an employee has been assigned to any departments, these will be available for allocation at the bottom of this screen, and be reflected on departmental reporting once rostered shifts are imported into the Pays area, later on. Rostered shifts can be viewed, edited and manually scheduled under the Rosters section of Lightning Payroll. Repeating shifts will generate automatically when you first view a pay run within the Rosters screen. If you accidentally edit or delete any rostered shifts and wish to bring everything back to the starting point again, use the Reload Repeats button. To add or edit rostered shifts to be worked during this pay run click the Edit Shifts button. To add a new, one-off shift manually, use the green plus button. You will then see the New Rostered Shift screen. When creating a shift, keep in mind that break durations are not paid. In this example the paid duration for a 9am - 5pm shift is 7.6hrs (7 hrs, 36 mins), shown at the bottom of the window (I.e. 8hrs - 24 minutes). The Options button provides a way for you to customise the display of your Rosters screen. For example, you can set your business operating days and hours so that the program does not display unnecessary days or time periods on the screen. If you roster your pay runs two or three pay peridos in advance, you can set the default pay run offset, which tells the program how far into the future the Rosters screen should display by default. Rostered shifts are automatically used to populate the pay information in Lightning Payroll, whenever they have been created. The absence of a roster shift will mean pays generate using the employee's default settings configured under Employees >> Pay Settings. Here are David's rostered shifts for the 15/06/17 pay run. He was rostered for two 3hr Late Shifts, which we created up above. When editing David's pay for the same pay run within the Pays screen we can see that his pay consists of the two combined Late Shifts he has worked. You may wish to use the Rosters section, but not have rostered shifts modify your Pays. If this the case, go into Employee >> Pay Settings and tick the box to Ignore rostered shifts when generating pays, shown below. Lightning Payroll includes a mobile Timeclock app for Android devices (Android version 4.4 and above) which can provide a way for you to precisely record when employees start and finish work. 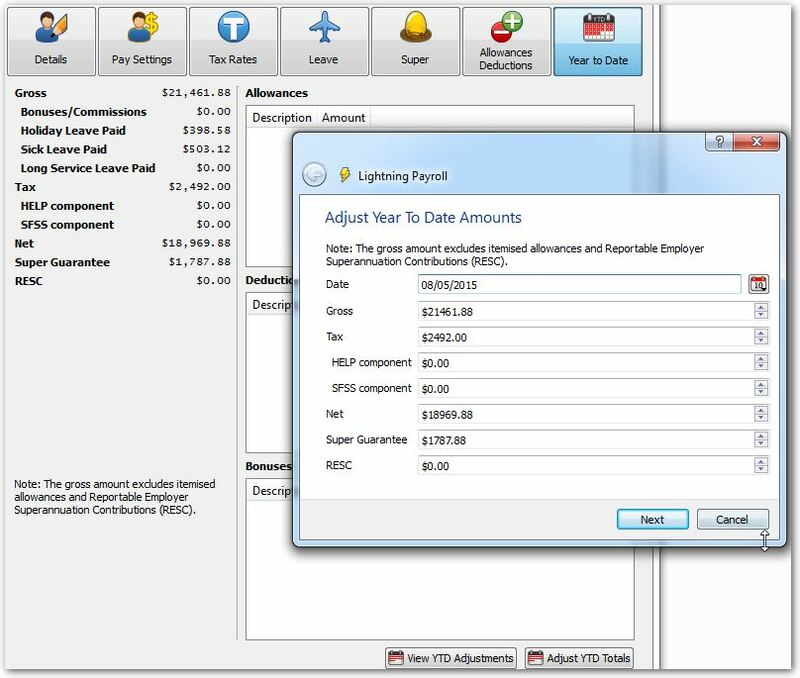 All hours and shifts recorded in the Lighting Payroll app can then be downloaded/synced with the Lightning Payroll Pays screen, filling out pays in seconds. Please click here for related shifts and rosters information. The first thing you’ll need to do is download the Lightning Payroll Android App on the Android device or devices you wish to use as a Lightning Payroll timeclock. To download the LP Timeclock, head over to the Google Play Store and follow the prompts to install the app. Updates will then be handled through Google Play. When you open the Android LP Timeclock app for the first time it will ask you to enter your Lightning Payroll subscription details and to login. This will connect the Android device to your Lightning Payroll account. If you are unsure of your account login details, they can be found inside Lightning Payroll under Tools >> Licence Details. When you first login your device will show you the Not Authorised screen, since it still needs to be authorised from the other side, within your Lightning Payroll software. Once authorised you will be able to view company and employee data and begin clocking in and out of shifts. To authorise the Android device, open Lightning Payroll and go into Company >> Shifts and click Check For Devices. The device will then appear, and allow you to give it a nickname for easy recognition and to set it to Active, confirming its connection to the company you are editing. To save the authorisation, click Send Updated Employee Data, and you should see a confirmation message, shown below. To update the newly authorised Android device, click the Refresh button at the bottom of the Not Authorised screen, or restart the app. Now that the device has been connected to your Lightning Payroll software, you're ready to go. The LP Timeclock app has been designed to be used on any number of devices that you wish to connect to your company. Ideally it would be used on a single device for all employees to share, but it is flexible enough to be installed on each employee's device if it needs to be used off-site. If you are using the device as a timeclock for more than one company, you will see a company selection screen by default. For most users however, only a single company will be connected to the device, so the employee selection screen will be the default home screen. To clock in, an employee just needs to tap their name and enter their timeclock pin. Their Timeclock PIN is a four digit number which is set to 1234 by default, but can be changed for each employee inside Lightning Payroll under Employees >> Details >> Timeclock Pin. Note: If you make any changes to an employee, their shifts or their Timeclock Pin, you will need to got into Company >> Shifts and click Send Updated Employee Data to update the device. Restarting Lightning Payroll refreshes devices automatically. Once the pin has been accepted, you will either a list of their shifts, or an error screen advising that they have no shifts set up yet. If no shifts are visible, then you will need to set them up in Lightning Payroll under Company >> Shifts as demonstrated in our related FAQ. If all is well, their associated shifts will be shown. The employee can then select the appropriate shift that they'd like to clock into. They'll then be instantly clocked in. Press OK to be returned to the beginning. Clocking out is achieved by repeating the process. The employee must select their name from the list, and enter their four digit Timeclock PIN. They will then see the shift they are currently clocked into. Press the Clock Out button to clock out. The most important part of the process is the importing of the timeclock data into your pay run. This is done in Lightning Payroll under Pays, using the Timeclock Sync button. The Timeclock Sync window shows any completed timeclock shifts that are available for importing into the current pay run. You can set these shifts to round up, down or two the nearest minute, five minutes, etc. if you like. The tickbox to Include Unrostered Shifts allows you to import shifts into your Pays without having to have those shifts pre-scheduled within the Rosters screen, as described in our related FAQ. Importing an unrostered, timeclock shift will automatically create a rostered shift which is what the Pays screen uses to gather worked hours, allowances, and pay rates from. Note: Times shown do not match times clocked in/out, as they are for demonstration only. For raw timeclock information, including details on all shifts currently underway, their is a timeclock report. This report can be found under Reports >> Timeclock. Why Can't I Open Lightning Payroll? Why Is Lightning Payroll Asking Me For My Licence Details? Why is an Employee 'Locked'? If you are ever unable to open Lightning Payroll, please try uninstalling and reinstalling the software. This issue can occur for many reasons, such as Windows/Mac/software updates or antivirus interference. This solution is fairly simple and reliable however, and best of all your pay data is safe and won't go anywhere. To uninstall, click on Start >> All Programs or All Apps >> Lightning Payroll >> Uninstall. 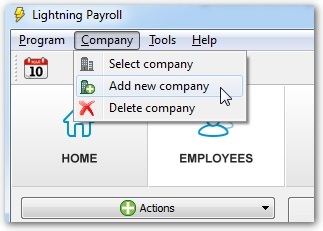 If you don't see this option, try right-clicking on Lightning Payroll for an uninstall option. You can also uninstall programs from the Windows Control Panel. Once you've cleared out the current version of Lightning Payroll, you can download and reinstall Lightning Payroll from here (Windows XP and above). To uninstall Lightning Payroll on a mac, click on Finder >> navigate to Applications >> right click Lightning Payroll >> select Move to Trash. You can also simply use your mouse to drag Lightning Payroll from the Applications folder down into the trash can. Once you've done that you can download and reinstall Lightning Payroll from here (Mac OSX versions 10.111212121212121212121212 and above). 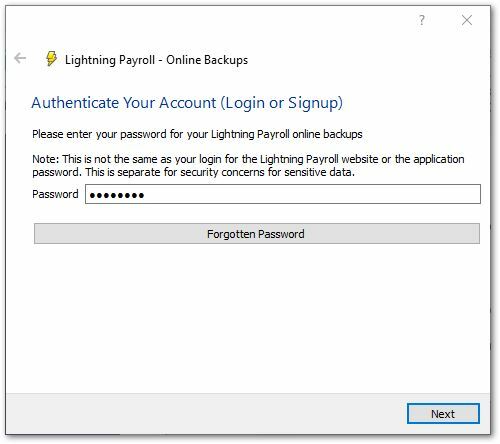 Some Windows users can encounter issues when opening Lightning Payroll due to insufficient privileges on their Windows User Account. Lightning Payroll requires Administrator privileges to function fully. While uninstalling and reinstalling Lightning Payroll is a reliable fix if the program is not opening, this issue is commonly related to user rights. Simply running Lightning Payroll as Administrator may fix the issue. Please see below for info on how to run Lightning Payroll as admin. 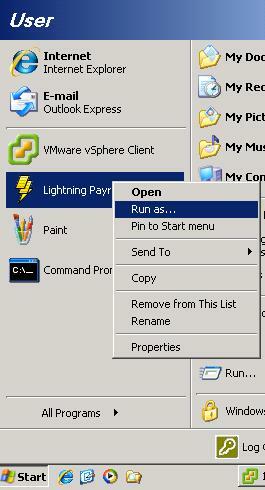 To run Lightning Payroll as administrator simply right-click the Lightning Payroll shortcut on your desktop or taskbar and then click 'Run as Administrator'. 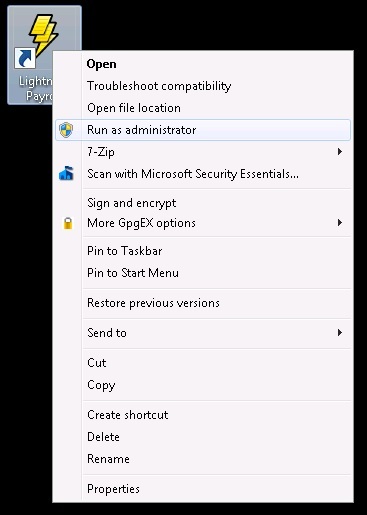 This can look a little different depending on your version of Windows, and on Windows 10 you'll have to right click the shortcut, and then also right click on Lightning Payroll within the shortcut, as shown in the picture below. After opening Lightning Payroll, you may occasionally be prompted to enter your licence details. This will occur if your subscription has expired, but it can also occur from time to time for security reasons, and to ensure that you're running the latest version of Lightning Payroll. If this occurs, please enter your registered email address and subscription ID number. Your subscription ID is always a six-digit number. This number gets emailed through when you renew your subscription each year, and it can also be seen by logging in to your account here on our web page (shown below). If you encounter a Signature Invalid for licence error (shown below) when entering your licence it usually means that you're on an older version of Lightning Payroll. Click here for help updating Lightning Payroll to the latest version. If you encounter an error saying The number of registered systems has reached the maximum allowed by this licence (shown below) then your subscription ID has already been used on two separate computers since renewal. You'll need to remove your licence from one of the two other computers under Tools >> Licence Details >> Remove System before it can be re-used once again. 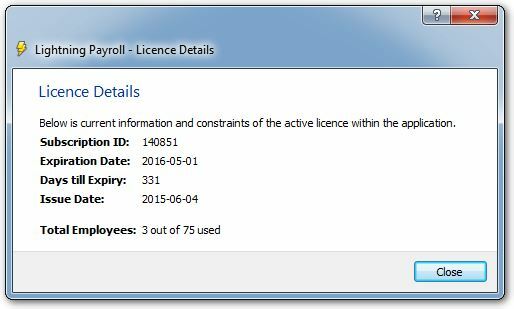 If you encounter a Local Licence Install screen (shown below) when entering your licence it may mean that you're on an older version of Lightning Payroll. Click here for help updating Lightning Payroll to the latest version. It can also mean that Lightning Payroll is unable to connect to the internet. Please check your internet connection, and if that fails try disabling third-party antivirus/firewall software, as they may need to have an exception created. If you ever see one or more employees listed as Locked under Employees, it is usually due to a licence issue. 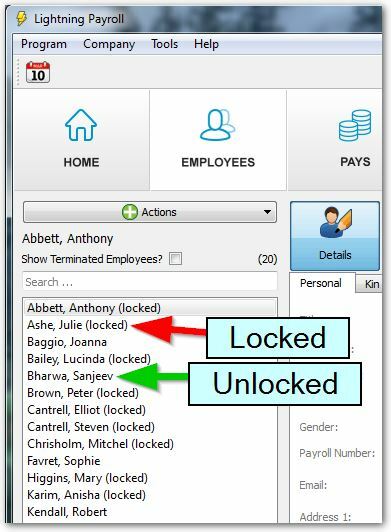 If only some of your employees are listed as Locked (shown above) then you are exceeding the allowed number of employees for your current licence tier, and will likely need to upgrade. To check the expiration date or the employee limit of your currently installed licence/subscription, go to Tools >> Licence Details . Note: Sometimes terminated staff affect the limit if they've been left active within the program. Click here to learn how to terminate . If all terminations have been kept up-to-date and you still can't pay all the staff you need to, you'll just need to upgrade to the next licence tier. If all employees are listed as Locked then the program does not detect a valid licence/subscription at all. This means you'll be in 'read-only' mode and will only be able to do things like view and print information, but not add employees or enter pays. Perhaps it has expired, or you're yet to enter the new subscription ID number which gets emailed through each year following payment under Tools >> Licence Assistant.